I am a crocheted accessories designer and maker. 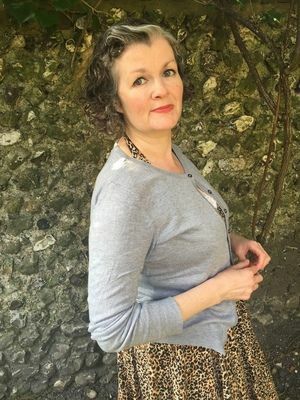 I also knit and sew, and am a printmaker. I have written a range of craft books published by the Guild of Master Craftsman Publications. These cover a variety of creative disciplines, suitable for the beginner through to the advanced maker. I also create projects for various craft magazines. There are ten projects including a cardinal, a robin and a bald eagle. The larger birds, such as the eagle, are much smaller than their real-life counterparts, so won't be a huge task to make. The bodies are worked in continuous rounds and shaped by crocheting short rows. The wings and tails use a number of different stitches to form the shaping and give the impression of plumage. Colour-work is used in a few of the projects, such as the robin. There are also instructions to make little eggs to go with each bird. All of the projects have written instructions and charts to accompany them to make it easy to follow the patterns. My desk is at a window that looks out onto my garden where lots of birds like to visit. The variety of shapes and colours inspired me to make the crocheted bird sculptures that form the collection in this book. 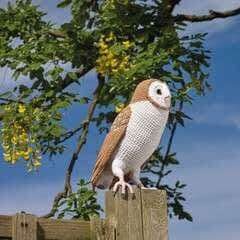 The barn owl and swan are my favourite projects. I'm really pleased with the shaping of the owl's face and the embroidered feather detail, and I think the swan looks very elegant. I have just moved house and have a much smaller room to work from than before. I have put my desk in front of the window that looks out onto my new garden which is full of wild birds, and my pet ducks and chickens. I have crammed my huge collection of old patterns on shelves and have my crochet hooks, pencils and scissors in vintage swan vases on my desk and windowsill. I have my radio on all day while I work. I was taught to sew and crochet when I was a little girl. I studied fashion and textiles at college but hadn't done any hand knitting for a long time. When I was pregnant with my first child, my mother took me shopping for yarn and helped me knit a cardigan for my baby. Since then I started designing my own patterns for my family, and am now very lucky to be working full time in this creative field. My grandmother taught me to crochet granny squares and I'd make blankets for my dolls. I still have the first granny square I made. I love Sonia Delaunay’s textiles and art and am inspired by her geometric patterns. Karen Nicol's embroidery is beautiful. She uses various materials, which I also like to do in my work. I enjoy looking into traditional techniques and browsing through the old craft patterns and books that I have. I also like to keep up with current trends through fashion magazines. I am inspired by film and theatre, vintage fashion illustration and photography, and in nature. I am lucky to live in the countryside so have a limitless supply of inspiration on my doorstep. I am currently working on a new book of crocheted hat patterns. The collection of 15 simple projects includes a beret, a ribbed hat and a wide brimmed sunhat. 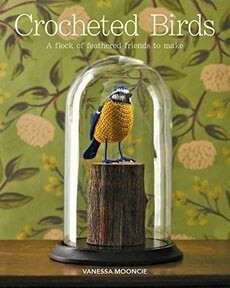 Let your creative urges take flight with this wonderful collection of birds to crochet. Featuring 10 gorgeous projects, all with stunning photographs and detailed charts, Crocheted Birds is a bird lovers delight! includes extensive techniques section suitable for all skill levels 10 projects for adorable crocheted birds projects include blackbird, wren and robin hand-drawn charts included with patterns Intricate charts are included with the patterns to help you make your feathered friends come to life!